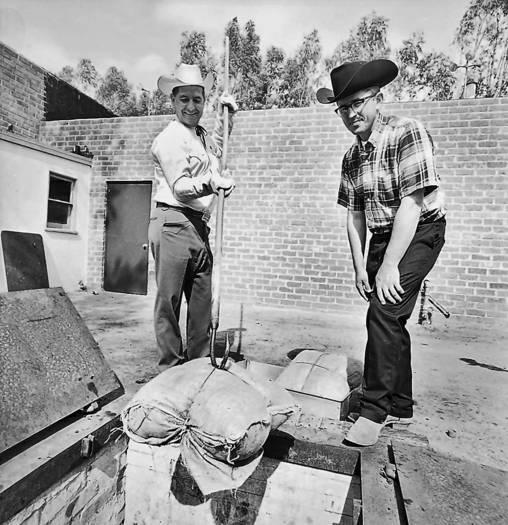 In this 1967 photo, Brother Lawrence Sandstrom, right, supervises as Emile Jacobs lowers meat into a pit at Rancho San Antonio, a Chatsworth group home run by the Brothers of Holy Cross religious order. The religious order's confidental files on Sandstrom, who resigned from the order in 1997, could become public as early as this month. Molestation allegations against Lawrence Sandstrom go back to the 1960s. His file will be among those released this summer by a host of independent Catholic orders. The preschooler's hair was falling out in clumps. He had stopped playing with other children and barely spoke to his teachers. He woke screaming each night, and during the day clung to his mother. What's wrong, she asked again and again. Finally, he told her: His big brother, adopted seven years earlier from the Maryvale Catholic orphanage in Rosemead, was molesting him. Devastated, she rushed the older boy to a therapist's office, where he offered a harrowing explanation. "He said that Brother Larry had done it to him at Maryvale — him and other children," his mother recalled years later. The man he named was Lawrence Sandstrom, a brother of the Holy Cross religious order and the subject of molestation allegations in Los Angeles stretching back to the 1960s. Over the years, claims against Sandstrom have cost the Catholic Church more than $3 million in civil settlements. But unlike in the L.A. Archdiocese, which released 12,000 pages of internal records on abusive priests in January, there has yet to be a full accounting of the church's handling of Sandstrom. That will change this summer when the Holy Cross brothers and a host of other Catholic orders make public the personnel files of as many as 139 priests, brothers and nuns accused of abusing children in the Los Angeles area. Although the failings of the archdiocese in dealing with abuse have been well documented, the response of independent religious orders, who minister around the world, is less known. Orders such as the Jesuits, Salesians and Carmelites had more clergy working in the region than the archdiocese itself when some of the worst molestation occurred. Oversight of those priests rested not with the archbishop but with the superiors of some 50 far-flung orders headquartered across the country. Among those whose files will be made public are a Piarist father who was prosecuted in both Los Angeles and Texas for sexual assault of teenagers and a Dominican priest who fled to his native Philippines after another priest discovered a 17-year-old in his bed. The contents of Sandstrom's confidential file hold particular interest because what is known publicly about his case is conflicting. The young and psychologically troubled children at the orphanage in 1983 made for less than reliable witnesses, and authorities were divided about the validity of their claims. Prosecutors said they didn't have enough evidence to file criminal charges against Sandstrom, but a judge overseeing foster children found that he had sodomized 4-year-olds. Sandstrom insisted on his innocence, and his superiors in the order and at the orphanage backed him up, writing glowing letters of recommendation to help him get teaching jobs at Catholic high schools. A lawyer for the Holy Cross brothers said the order's file on Sandstrom runs hundreds of pages and could become public as early as this month. Sandstrom, 73, resigned from the order in 1997 for reasons the order said were unrelated to abuse allegations. He now sells kitchen countertops in New Orleans and did not return messages seeking comment. Chief among the long-unanswered questions is what the order knew about Sandstrom when he was sent to be executive director of Maryvale, an orphanage for especially vulnerable children run by an order of nuns. Elizabeth Gori, who became the guardian of a second boy allegedly molested by Sandstrom, said she hoped the files might "uncover all this stuff the church has been hiding for all those years." "I only had bits and pieces at the time, and I was trying to focus on what would help" the boy, she said. Court filings, archdiocese records and interviews provide a partial picture of Sandstrom's troubles in Los Angeles. The boy Gori cared for was one of several Maryvale children who returned from an outing with Sandstrom in the San Bernardino Mountains displaying behavior one orphanage social worker described as "unusually sexual." "They kept referring to a secret," social worker Mary Jane Landrock wrote at the time. She called a child abuse hotline. In interviews with detectives, one boy described in detail how "Brother Larry" sodomized him, but the other children's statements were less clear. "One of the children only talks in riddles & another is called a liar by the other children," a prosecutor wrote of the boy later cared for by Gori and a girl who went on the outing. Two boys ultimately accused Sandstrom of molesting them. Sandstrom denied harming the children but declined to be interviewed by investigators or take a polygraph test. Ultimately sheriff's detectives and county social services workers said they could not substantiate the claims. When Landrock kept voicing her suspicions, Sandstrom fired her. The orphanage later paid her $25,000 as part of a settlement in which she agreed never to disparage Maryvale employees. In the weeks after the allegations surfaced, the boy who talked in riddles was moved to another group home where his sexual acting out again drew attention and led a judge to convene a hearing. After listening to testimony from Landrock and others — but not from Sandstrom — the judge ruled that he had sexually abused the children and banished him from Maryvale. Sandstrom left but maintained his innocence, hiring a lawyer to challenge the judge's order. A different judge tossed out parts of the previous judge's order, including the finding that Sandstrom had abused children. With recommendation letters from the orphanage, he went on to work at La Salle High School in Pasadena and other Catholic schools in Hayward and New Orleans. Meanwhile, the two boys he was accused of abusing struggled. Gori decided against adopting the boy she cared for because his 12-hour tantrums were too much for her. "There was so much anger, and he was too little to explain," she recalled. He was admitted to a state psychiatric hospital, where he remained until he turned 18. The other boy, the one who detailed being sodomized by Sandstrom, was adopted by a young, devoutly Catholic couple from the San Gabriel Valley. In a lawsuit filed in 1994, the couple said they were never informed of the suspected molestation. They said they learned of the allegations only after their adopted son abused both of their biological children. "It was a living hell," the mother recalled in a deposition. "There was no joy, no laughter in the household." The boy in the psychiatric hospital joined their lawsuit against the order and Maryvale. In the litigation, it emerged that officials at Maryvale were aware of rumors that Sandstrom may have abused children before he was hired. His order, however, denied the rumors and said the first and only accusation was at Maryvale and that it was false. The orphanage settled the claims with both boys in 1996, reaching an undisclosed financial agreement with the San Gabriel Valley family and paying the other nearly $100,000. Despite the payouts, the order never wavered in its defense of Sandstrom. When the San Gabriel Valley mother wrote a letter expressing worry that Sandstrom might harm other children, a Holy Cross leader responded by offering "as much assurance as life affords" that he posed no danger. "Neither before nor since he held his position at Maryvale has there been any reason to suspect sexual misconduct," Brother Donald Blauvelt wrote. In 2003, however, a man named Rick Adair stepped forward with an account that raised questions about Blauvelt's assertion. In a lawsuit, Adair said Sandstrom had engaged in inappropriate sexual conduct with juvenile delinquents at Rancho San Antonio, a Holy Cross-run group home in Chatsworth, in the late 1960s. The headmaster, a Holy Cross brother, was told of Sandstrom's alleged behavior at the time, he claimed. Adair and another man said that Sandstrom made them and other boys strip naked for group therapy. The second man said Sandstrom sometimes masturbated in the back of the room. Adair recalled this week that when one boy complained that Sandstrom had forced him to perform a naked massage, the headmaster called a meeting and "told us in no uncertain terms that we would not discuss [the boy's] accusations with anyone." Adair said that in 1993, he phoned the order's Texas headquarters and told Blauvelt, the top official there, of Sandstrom's alleged misconduct. He said Blauvelt didn't seem surprised and simply asked how much money he wanted. Adair said $50,000; Blauvelt offered to get on a plane to personally deliver a check, he said. Ultimately, Adair backed out. An attorney for the Holy Cross brothers disputed that account this week, saying the order never promised Adair compensation, let alone a hand-delivered check. Over the next decade and a half, the legal landscape changed dramatically, with thousands suing the church across the country. By 2007, the payouts were averaging in the seven figures. Although neither of the Rancho San Antonio students alleged that Sandstrom ever touched them, both received $1.5 million as part of a 2007 settlement. That agreement also provided for the upcoming release of clergy personnel files. The boy who spent most of his childhood in a psychiatric hospital has had a rocky adulthood, with a string of criminal convictions and stints behind bars. Now 35, he said he couldn't talk about Sandstrom because of a confidentiality clause in his settlement. He became a father last year and recently reconnected with Gori, his onetime guardian. "He said, 'There wasn't anything else you could have done.' I was so grateful for that," Gori said. The San Gabriel Valley family also said they were barred from speaking by the terms of their settlement. The family spent hundreds of thousands of dollars on treatment for their children, according to court documents. Their adopted son, 35, is now married with children, owns his own business and boasts on its website of his supportive and loving family.